On August 27, I received an email from a landlord in New York City about falling rents and concessions. Please consider a snip from Landlord From NYC Chimes In On Falling Rents. I'm a landlord here in NYC (as well as an avid reader of your blog) and I actually feel the 7-10% drop mentioned in the article understates the case somewhat. 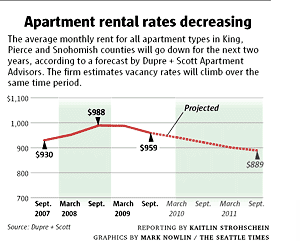 Based on what I'm experiencing, I'd say that rents are down 10 to perhaps as high as 20% from their peaks. With home prices crashing year-over-year and both housing rents and apartment rents droping as well one might think that falling rents would be reflected in the CPI. In what should be no surprise to anyone, the BLS is not in the ballpark. Here are some numbers and a chart. equivalent rent increased 0.1 percent. CPI Data for August 2009: The rent index was unchanged and the index for owners’ equivalent rent increased 0.1 percent. CPI Data for July 2009: The indexes for rent and owners’ equivalent rent were unchanged. The BLS is reporting that rent from the first half of 2009 is up 3.1 % from the first half of 2008. The BLS is reporting that OER from the first half of 2009 is up 2.1 % from the first half of 2008. Rent of primary residence (rent) and Owners' equivalent rent of primary residence (rental equivalence) are the two main shelter components of the Consumer Price Index (CPI). Rental equivalence. This approach measures the change in the price of the shelter services provided by owner-occupied housing. Rental equivalence measures the change in the implicit rent, which is the amount a homeowner would pay to rent, or would earn from renting, his or her home in a competitive market. 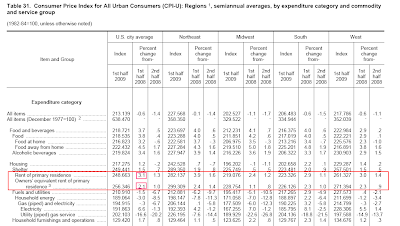 Note that OER is the single largest component of the CPI at 23.83%. 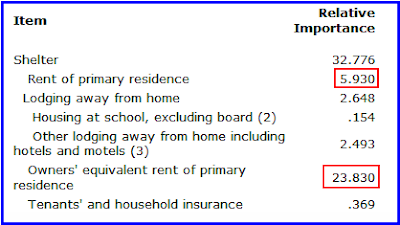 OER plus rent of primary residence is a whopping 29.96% of the CPI. With home prices crashing, a massive inventory of unsold homes, and a massive shadow inventory of unsold homes on top of that, does anyone think that rental prices of homes is rising? Bear in mind that everyone but the BLS seems to know that rent prices are dropping like a rock. This is not the first major error by the BLS. I have been harping for two straight years that a massive revision in jobs was coming because of a fatally flawed Birth/Death Model. Last Friday, the BLS announced they would revise the number of jobs lost during the recession by a whopping 824,000. Please see Huge Downward Jobs Revisions Coming for details. Most were shocked by this announcement. The only shock to me is how low the number is. Look for an upward revision (or for the BLS to smooth the number over time). Rents of primary residence are clearly falling and OER should be falling as well. Given that OER and rent make up 29.96% of the CPI, the Year-Over-Year CPI is massively overstated at -1.5%. The BLS is once again in the twilight zone.